We believe in rewarding customer loyalty so we offer incredible discount offers that can be stacked with sales and even coupons (see below). We also want to give everyone a chance to buy with our biggest discounted pricing so we offer some listings with our "Super Savings" pricing. The "Super Savings" pricing is our rock-bottom price that everyone can enjoy regardless of membership level. The listings that do not have discounts will have our "Super Savings" icon at the bottom of the listing or state there is no further discount in text. The Witchcraft, Pagan, New Age, Wiccan, Occult, Spiritual Supplies & Tools is the only category that is third party and therefore never has any discounts. The price shown is the base price, with no sale discounts or membership discounts. You will see the base price reflected on the screen while you are shopping. If you have any membership discounts you will see the actual price you will pay in the shopping cart screen during check out. With the 50% off Eterna discount this collector will receive the $485 binding for only $84.87! How do I get the additional discount off the sale? Our Customer Loyalty Program is amazing. Our membership discounts are free. Eterna is the only membership that is paid for. 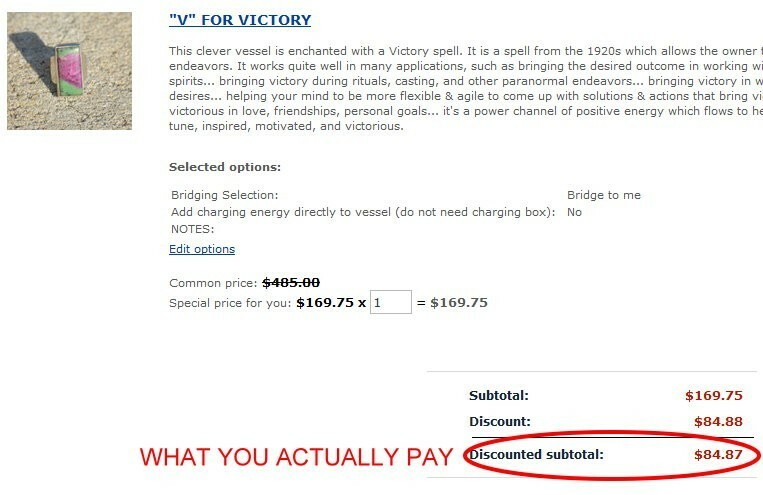 It costs $150 and it is a permanent, lifetime discount of 50% off. It can be found here. To apply for membership you log into the shop, click on the "My Account" link, and then scroll down to the "Account Information" heading and select the membership you are applying from the drop-down box. Forum: If you are a member of our here, you can apply for the Forum membership. This is a permanent 20% off at all times. Sentio: If you have spent more than $300 in the shop between all of your processed/completed orders you can apply for this membership. This is a permanent 30% off at all times. Diamante: If you have spent more than $2,000 in the shop between all of your processed/completed orders you can apply for this membership. This is a permanent 40% off at all times. Carissimi: If you have spent more than $10,000 in the shop between all of your processed/completed orders you can apply for this membership. This is a permanent 55% off at all times. If you see "Reviewer" in front of the membership it means the person has signed up for our "Reviewer" program where CH members get to review new bindings at no charge.